The classic 1987 animated series “DuckTales” is coming back to TV in a revival (or reboot). Disney’s announced a new “DuckTales” series will be produced for Disney XD, and will debut sometime in 2017. 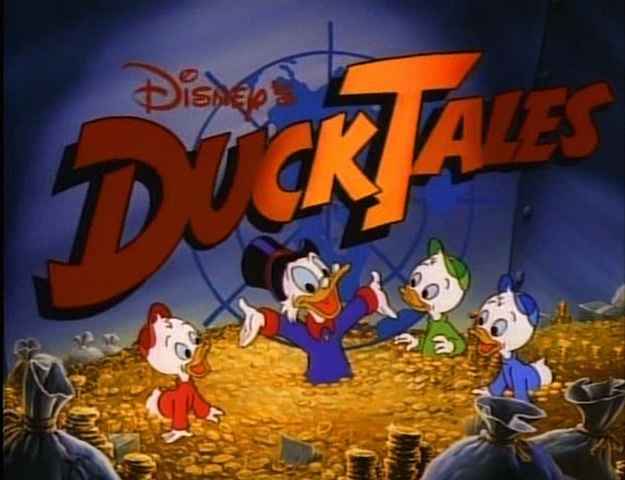 “DuckTales” was a turning point for TV animation, and in my opinion, the TV cartoon that helped spark the modern era of well-produced TV animation. As a junior high school student, this was the first TV animated series I saw that I thought looked “good”—as in “well animated,” compared to the 70s and 80s Filmation and Hanna-Barbera cartoons I’d grown up with. The writing was also strong as well; using Carl Barks stories for various episodes helped. “DuckTales” also involved classic Disney characters, who I’d usually only see when “The Wonderful World of Disney” bothered to air old Disney shorts. Finally, “DuckTales” wasn’t like anything else that I’d seen on TV: it wasn’t based on a toy; it wasn’t a kid version of an adult character; it wasn’t over-the-top cute; it didn’t (always) involve solving mysteries. Thanks to the success of “DuckTales” (and the revival of its theatrical animation division), Disney expanded into other TV series, leading to the famed “Disney Afternoon” lineup (“Rescue Rangers,” “TailSpin,” etc.) and “Darkwing Duck.” Not to be outdone, rival studio Warner Bros. also got into TV animation, giving us classics like “Tiny Toon Adventures,” “Batman: The Animated Series,” and “Animaniacs.” And, of course, “The Simpsons” influenced primetime animation greatly. Traditional animation or CGI? Disney XD’s pretty friendly toward 2D animation (“Gravity Falls,” etc. ), and Disney itself has been producing an excellent series of 2D animated shorts starring Mickey, Donald, and Goofy. (Scrooge even appeared in one short!) However, CGI’s still heavily in vogue, and it might be seen as one way to differentiate this series from its Reagan-era predecessor. The press release mentions Donald being a star, so it’ll probably be even closer to the Barks comics’ tone than even the 80s series, which shipped Donald off to the navy and replaced him on most adventures with Launchpad. No idea if the Don Rosa comics will be used at all. Disney might want a stronger presence of women in the series than the 80s series, when Mrs. Beakley and Webby were the main two recurring female characters. (The villains included Ma Beagle and Magica De Spell.) If so, I’d suggest adding Daisy, along with Daisy’s triplet nieces from the comics, April, May, and June. The three were members of the “Junior Chickadees,” the Girl Scouts-like counterpart to the boys’ Junior Woodchucks. Who’ll be cast to do the voices. Most of the secondary voices (Mrs. Beakley, etc.) were recast for the remastered “DuckTales” video game released in 2013, as their original voice artists had since retired or passed away. As for Scrooge himself, Alan Young‘s been the near-sole voice of Scrooge for decades. While Young is 95 years old, he’s also still done the voice recently, for the aforementioned video game and Mickey Mouse cartoon. Similarly, June Foray’s 97 years old, but still doing voice work, including Magica in the “DuckTales” video game; Foray was also the voice of Ma Beagle. Of course, I hope this means Disney will release the fourth and final volume of “DuckTales” episodes to DVD, so I can complete my collection. Said missing DVD set contains the bulk of the GizmoDuck episodes, as well as adaptions of comic stories like “The Unsafe Safe” (the TV episode “The Unbreakable Bin”; Scrooge plates the money bin in an unbreakable glass). Finally, no post on major “DuckTales” news is complete without the classic theme song, so enjoy.